Johannes Katakarinja was born in 1956 and is the youngest of seven children. Johannes learnt to paint as a boy from his grandfather, the famous artist Walter Ebatarinja (1915-1968). Together they journeyed out on country to paint landscapes at picturesque valleys, gorges and sites including Palm Valley. Like his grandfather, Johannes paints in a traditional regional style referred to as the Hermannsburg School. Johannes currently lives in Alice Springs and travels to his homeland of Hermannsburg regularly. 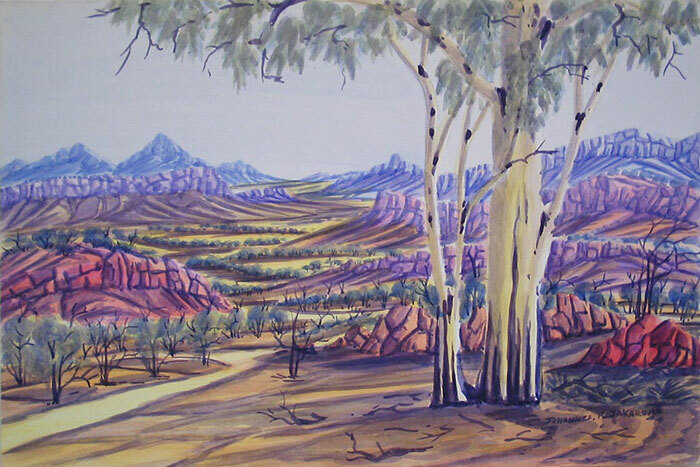 Johannas was commissioned to paint the mural at Hermannsburg Finke River Mission Store.